Small air driven drip system. Drip Hydroponic System. The perfect introductory hydro system for small spaces. The EcoGrower incorporates an air driven “spider” drip system and uses our revolutionary 17 gallon hexagonal reservoir with removable 6” lid inserts. Each lid insert accommodates one 6” net pot that can house large plants. Clay pebbles included. 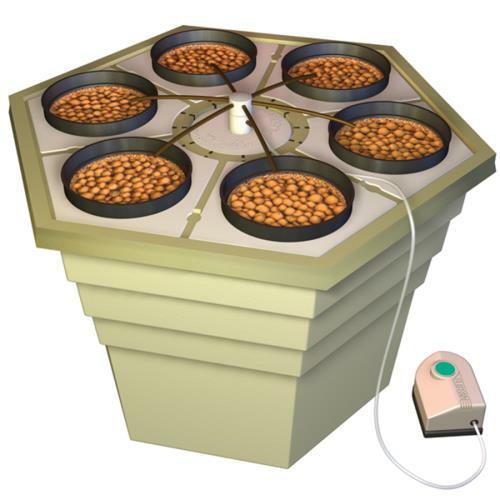 The EcoGrower® incorporates an air driven spider drip system and uses the same revolutionary hexagonal reservoir with removable six inch lid inserts. Each lid insert will accommodate one 6 in net pot that can easily grow very large plants. In keeping with our commitment to the environment, General Hydroponics® will soon release versions of the EcoGrower® that will operate with electricity recovered from solar panels. Includes: 17-Gallon reservoir, spider drip assemble, pumping column, insert lid, six – 6 in lid inserts, net cups, CocoTek® liners, Elite 800 air pump, 1/4 in air line, clay pebbles, Flora nutrients.